One of the many bonuses of blogging, or any type of diary for that matter, is the ability to look back and assess the past year. I like doing that personally, and also reading up on how other bloggers did with their goals for the year. I had stated at the beginning of the year, that my focus was going to be on using up my overflowing scraps. That didn't happen. Somewhere along the line the focus shifted, thanks to the encouragement of my friend Gail, from using up the scraps to finishing up UFOs. So, the scraps didn't get used as much as I'd hoped, but I did finish up quite a few UFOs. Two of them got to finished top stage, and eight of them to completely finished stage. I also did three new projects this year, that have now been added to the top's to be quilted pile. I'm very happy with the amount I got accomplished this past year. I'll do a photo line up. This is my latest finish of a flimsy, a Triple Four Patch, done for the Scrap Happy 2014 colour challenge. This is my 2014 New Years day gift to myself. 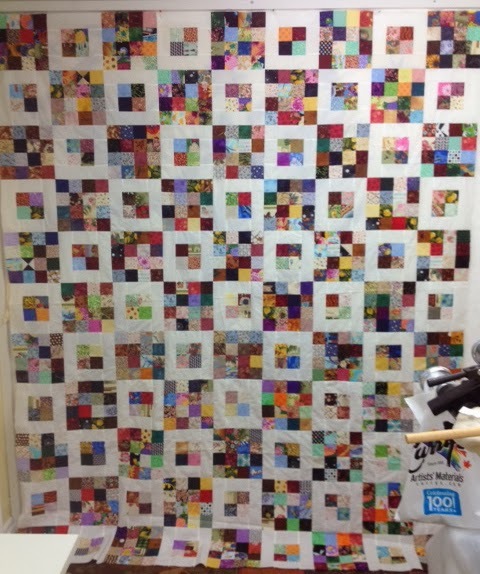 I started this quilt, Three of a Kind by Judy Martin on January 1st, 2014. This is my version of a Blooming Nine Patch. I started this because I'd seen another on the internet, and fell in love. I'd always wanted to do one. Both of these next quilts were leader and ender projects that were finished up to the flimsy stage this year. And finally, finished Quilts are listed next. Camp Out, named because of the camping themed fabrics in both the top and the backing, was made from a collection of Nine Patches, received from a guild sponsored swap. There are still more Nine Patches waiting to become something. This is a quilt named Summer Rental, a design from Miss Rosie's Quilt Co. For some unknown reason, I don't have a picture of the full quilt. Meteor Shower, another design by Judy Martin, started in 2013 and finished this year. I love her patterns. I just might start 2015 by starting another of her quilts. In Full Bloom, a design by McKenna Ryan, The was started in my pre-blogging days, so before 2010, but was finally finished this year. Cactus Rose, a design by Judy Niemeyer, started in 2010, finished in 2014. 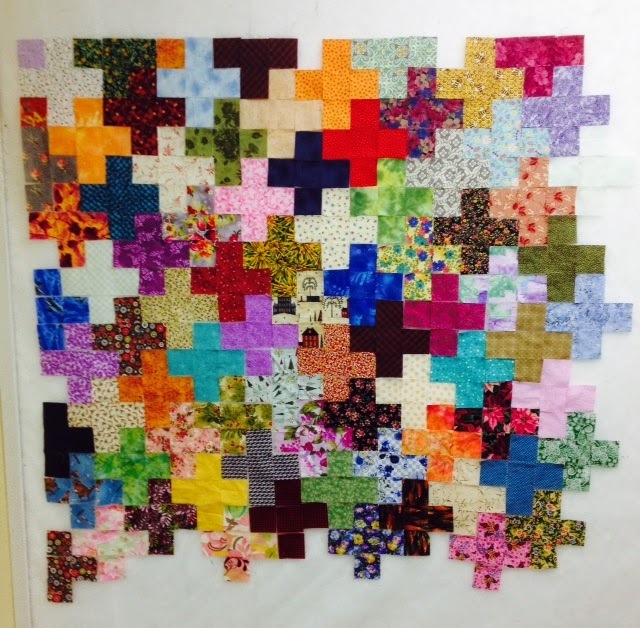 Grandmother's Choice, a block of the week, designed by Barbara Blackman from during 2012-2013. This is my last finish of the year, completed on Dec. 30. It's going to a new home as a Christmas gift. 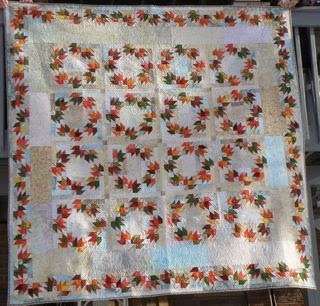 Thanksgiving Leaves, another design by Judy Martin. Lazy Sunday , a mystery designed by Bonnie Hunter, and published over 4 issues of Quiltmaker magazine. And finally, there are two smaller projects. This first is the result of a round robin done among four of us from the guild. I did the centre sewing machine and spools border. It was a block in one of the 100 blocks magazines that are put out by Quiltmaker. And this little trailer is parked in the location that my imagination decided was the perfect place for a Road Runs Through It, a guild challenge. And that's it...... my year in pictures. In addition to all these projects of mine, were all of the quilts I was privileged to work on for my wonderful customers. I've documented some of them on this blog over the past year. I have five more left to document, and then this year is done. My excuse for not having them done yet is that some were intended as Christmas gifts, and I didn't want to give the surprises away. The fact that the likelihood that their recipients would see them on my blog is slim, is totally beside the point. Tomorrow, I'll do up a post of what I would like to see happen, God willing, in the coming year. I'm continuing on with the plus sign quilt. The section on the left is all sewn together. I'm adding another nine rows to the bottom, and I think seven more rows to the side. It should end up being a nice size for a lap or snuggle quilt. I'll probably end up donating it, either to the children's aid, or to a women's shelter, once it's all done and quilted. I'm going to work on this some more tonight, and see how much further I can get on it. I'm linking up to Connie's Linky Tuesday and to the Needle and Thread Network. I'm hoping by this time next week, this will be a finished top. If I'm doing Sunday stitching, I usually combine this post with the stash report post. However, I haven't done any hand stitching in ages, and hadn't really planned on doing any today either. However, I decided that I really didn't want to do anything else today, and I really want to get back into the hand stitching. I originally had plans on making a whole pile of these Patchwork of the Crosses blocks, but I think I've changed my mind. I came across a wonderful project while blog surfing a while back, found at Faeries and Fibres. However, I'm not a big fan of the basket border, but then I got thinking that, instead of the baskets, I could put these in the corners, and then a partial version of this block in the border. So, now I've got myself all excited about starting a new project. I seem to have dragged Charlene along with me. I know that she's a big fan of hexies and English Paper piecing, so every time I come across an interesting project, I email the link to her for her to look at. Somehow or other, it's worked out that we are both going to do a version of that quilt. And then, to make matters worse, or better, depending on how you look at it, I emailed her the link to this project being done at Lilabelle Lane, called La Passacaglia. Well, that kinda snowballed into Charlene and myself, and also Lorna who is a member of the guild, buying the book with the pattern in it. So, there are plans afoot to make that one as well. The goal is to have them done before the next quilt show, two years from now. Who knew I could get into so much trouble from sending a couple of emails. I've ordered the paper shapes for La Passacaglia, and am looking forward to them coming in the mail. Charlene and I will get together later on in January to begin our English Paper Piecing marathon, which should be lots of fun. In the meantime, I'll finish this, and get a start on the other one. I came awfully close to adding more yesterday, during surfing a couple of sites with sales. One of the sites was advertising free shipping to Canada, so I filled up a shopping cart. However, when I went to check out, there was no place to type in the info to get the free shipping, even though I did everything they said to do. So I emptied the cart and walked away. Then I found another site having a fabulous sale, started putting stuff in the cart, but stopped myself and walked away from that one too. So, no new stuff coming in for the new year. Compared to the last few years, I've added considerably less. But I also used less than in 2011 or 2012. I beat, just by a little bit, what I used last year. But I think that is because I concentrated on finishing UFO's this year, and a lot of the fabric in those UFO's had already been counted, since I figure my usage out as I make the individual blocks for a quilt, rather than waiting until a quilt is finished. I had said at the end of last year, that I wanted to focus on using up scraps, but with finishing the UFO's, that didn't happen. So, I'm going to restate that as my goal for this year, to use up scraps. I have a few quilts picked out from books, and a few more designed out in Electric quilt with that goal in mind, so we'll see how it goes. I already have enough background fabrics to do at least two of the projects, so I don't need to add anything to the stash for doing them. Today was the last Saturday of the year. I know I'm not really saying anything there that most people don't already know, but it sure is surprising to me just how fast it came around. This was my first year participating in the Rainbow Scrap Challenge. At this time last year, I decided that there were three projects I wanted to work on through the year. I had all kinds of lofty plans that I could work on a different project each Saturday of the month, which gave me a spare Saturday each month, just in case something happened and I fell behind. I don't know who thought I was kidding, besides myself, that I'd ever be able to keep up. However, the good news is that I did get one project to the finished top stage. This Triple Four Patch was finished up at our guild's sew-in days back in November. It's still waiting for quilting. Another project that I was working on in the first part of the year were these pinwheels. Once the summer hit, and my sewing time decreased due to being outside more often, these blocks were left to languish. I'm thinking I have enough here to make a small child's quilt. Each block is 14 inches square. I'm just not quite sure what to do with that centre area. I don't particularly want to do another of these blocks. Any ideas out there for what to put in that centre section? These Bow Ties were another project that I started at the beginning of last year. This is a bit of what the lay out will look like. These stalled because the colours for some of the months were too light to show up against the background fabric I'm using, so it too languished in the colour challenge box. I'm going to pick this one back up and work on it again this year. I think I might be a bit more flexible with the fabric choices for the bow ties this year, and go for multi-coloured prints containing the colour of the month, or at least put in some prints so that the colours flow better. And then there are these nine patches, made from 1 1/2 inch squares and Kona white. These will work with the lighter colours that are chosen throughout the year that won't work with the bow ties. These nine patches will eventually end up in this quilt. I need 125 of them. Nine down and 116 to go. I'm linking up to the last Scrap happy post of the year. Or in this case, not on the needles because it's done! My Carabe sweater is finished. All of the ends are sewn in. It needs blocking and buttons and then it will be 100 percent finished and wearable. Next up is going to be this cowl, from a pattern in a magazine I was given for Christmas. I showed the picture of the cowl to my daughter, who agreed that it is lovely, and would like it, except that could I please make it longer. I looked at the pattern, saw that it had a pattern repeat of 15 stitches, and said sure, I can do that, just by increasing the number of stitches cast on by 50%. I cast it on yesterday, worked up to the first section of wrapped stitches, and discovered that, instead of it being a fifteen stitch pattern repeat, it's a 30 stitch repeat, and I was fifteen stitches short of the amount needed. So, it has been all ripped out and is waiting to be cast on, again......... sigh!! There is nothing on my wall today. I've taken down the plus sign section that I'd laid out on the wall, and I'm working on sewing that section together. I've got 14 rows webbed together, with 5 more to go. Then I can start sewing the seams in the other direction. When I get that done, I've told myself the fabric used in that part of the quilt can be totalled for the amount out of the stash. When I get another section of plus signs sewn together, I'll do the same thing. In the meantime, since every good blog post has a picture, these are another reason why there's nothing on my design wall. Only this report, and then one more, to see if I can get to a zero balance. I just might make it! This week's numbers are great, showing a backing made for my Rainbow Scrap Challenge quilt, and the five gifts, which I'm unable to show since certain people to whom they are going read my blog on occasion. It's a gorgeous day outside today, sun is shining in lovely blue skies, and we have plans to brave the crowds at the downtown market and check out some alternatives to the normal turkey dinner for Christmas day. We're thinking either lamb or goose. There is a vendor down at the market that sells both. Our son is coming to visit today, and is going to brave the crowds with us. That means just a brief post today. I'm linking to Judy's Stash Report. It's been a while since I did a knitting report, mostly because I've been working on stuff that can't be shown. 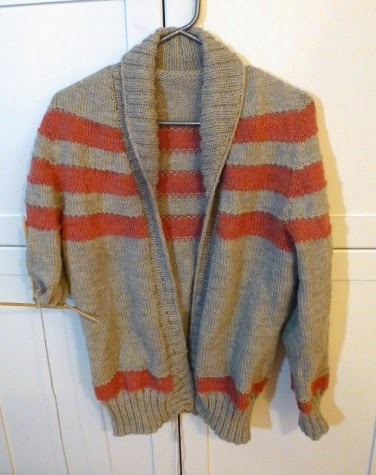 But I've also been working on my Carabe sweater, in between other things. I'm halfway done the second sleeve, so it's getting closer. This is going to be such a comfy and warm sweater. I'm looking forward to getting it done. I knitted it a bit bigger than the last few sweaters I've done, so I should be able to layer this one over thicker sweat shirts and stuff. It's going to need some heavy blocking, though. That front button band pulls up a lot, more than what shows in this picture. I gave it a good tug down, and then snapped the picture before it could snap back up again. In other news around here... all of my customer quilts needed before Christmas were finished on the 15th, and the last one is getting picked up on Monday. So, for the past 5 or 6 days, I've been able to get some backings done for my own projects, as well as some other gifts, also not able to be shown. I have one of my own quilt tops that needs to be quilted up that is going to be given as a gift for Christmas, so that's part of what I'll be doing today. I think I'm also going to play with some piecing on my Plus sign quilt. We are done all our shopping, except for last minute groceries. 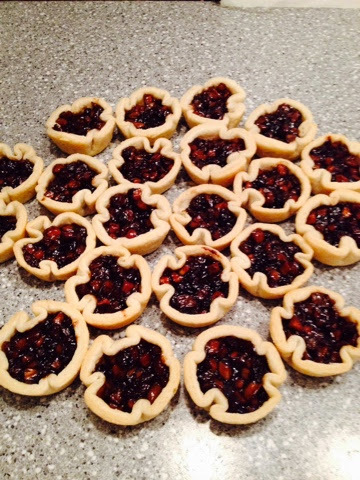 The baking remains to be done, probably on Tuesday. Once all of that, and the Christmas day fun and festivities are done, I'm going to sit down and do a summary of all that I got accomplished this past year, and do some planning for what I'd like to do next year. In the meantime, I'm going to take it easy, and play, and enjoy family and celebrating our Saviour's incarnation. I think Maureen said that the design for this quilt come from an Edyta Sitar collection. Correction- Maureen let me know that it is an adaptation of a Kim Diehl pattern, not Edyta Sitar. I really like the way that this quilt is laid out, with the three rows of broken dishes blocks, separated from each other by a row of rectangles. This would be a brilliant scrap buster quilt. I asked Maureen if her pile of scraps is any smaller...... the answer was nope. It was quilted with a free hand over all swirl. All those curves are a perfect compliment to all the angles in the piecing. This is a quilt I did up for Charlene not all that long ago. I'm actually almost all caught up with documenting the quilts I've done for customers over the past year. In this one, Charlene used a collection of fabrics, although I don't know the name of the collection. They are lovely soft, nursery type colours and patterns. I'm not sure if you can see the design on the light grey fabric inside the darker grey frame if you biggie size the picture. It's little tiny yellow airplanes. I just happened to have an airplane pantograph in my collection, and it seemed a perfect pairing for this quilt. Ok, now that is just too weird........ week 50 of 2014....... how did that come so fast?!?!? I had plans, great plans, on having my stash numbers read in negative numbers this year, meaning more used than added. I somehow don't think I'm going to make it. Oh well, a girl just has to have fabric to play with, and the choices in my stash for large amounts of fabric are getting limited. I've got lots of fat quarters, but not as much in yardage. I'm making pillow cases, and it was a real challenge to come up with combinations for the cuffs in fabrics that I had that weren't fat quarters. I have stash added numbers again this week, but almost all of it is for those pillow cases. The rest of it is diagonal stripes that I love using for bindings, and pick up whenever available. I'm continuing to make backings for quilts that are waiting for quilting, so that when time or mood hit, they are ready to be loaded onto the machine and finished. The next quilt getting a backing is my Rainbow Scrappy Challenge. I have some fabrics here, none of them more than a yard each, that fit into the "what on earth was I thinking?" category of fabrics. So I think I'm going to cut them up and make them into a scrappy type backing, along with left over blocks from the quilt. I'm linking up with Judy's Stash Report, and then I think I'll get to work on that backing. This is one very special quilt, made out of memories and love. Gail has friends who have a daughter with Rett's syndrome. Gail did a blog post about it here and here. I was so pleased to be able to be part of this quilt. The piecing on this is entirely free form. Gail decided that she wanted something different pieced into each of the filler areas between the t-shirts. It is a totally unique creation, not another one like it in the world. Several of the t-shirts that went into the quilt talked about "silent angels". So, it made perfect sense to use the angel pantograph on this quilt. What a beautiful, wonderful gift for Gail's friends and their daughter. This is the second of two quilts I did for Angie. Somehow, I missed getting a picture of the other one. For both of her quilts, she chose the Angel pantograph. This seems to be turning into a much used and wanted quilting design. It gives such lovely curves all over the quilt. 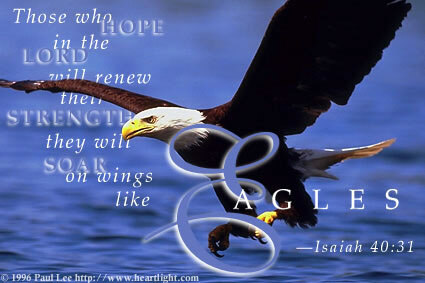 It's only when looking closely that the angels are obvious. Angie used such a soft and soothing colour palette in this lap quilt. It would be at home in almost any room it occupied. Here's a close up of all those soft lovely fabrics, and the curvy angel design on top of them. This is Maureen's Celtic Solstice, a Bonnie Hunter mystery from a few years ago. It's done just in time to start the mystery for this year, which I'm pretty sure Maureen said she's doing. She always puts her own spin on them, though, by using a different colour palette for them, or one that is similar, but more muted. I love the subtle colours in this one. I quilted it using the Northern Star pantograph. Stars and swirls, a perfect combination. Sandra made this quilt for her new grand baby. 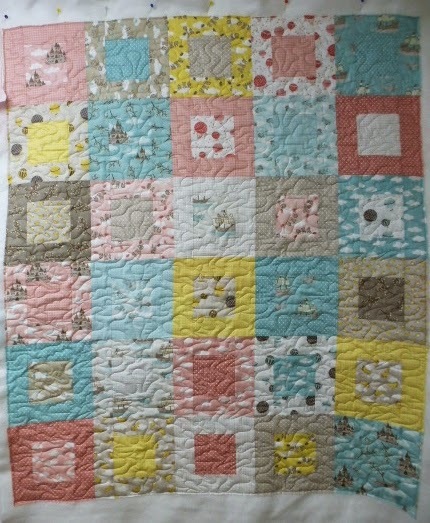 The mother didn't want a traditional baby quilt with pastel baby patterns. So, what she got was modern bright colours, sure to catch a baby's eye. And considering she didn't want a traditional baby quilt, I didn't want to do baby type quilting designs. Instead, I did continuous curves in the triangles, with a swirly type filler into the triangle. I then did the same continuous curves and filler swirls into the squares. Here's a close up of the fabrics and the quilting. It's a quilt that can follow this baby for many years to come. There is nothing dated or baby-ish about it at all. It can go from the nursery to the big kid room seamlessly. 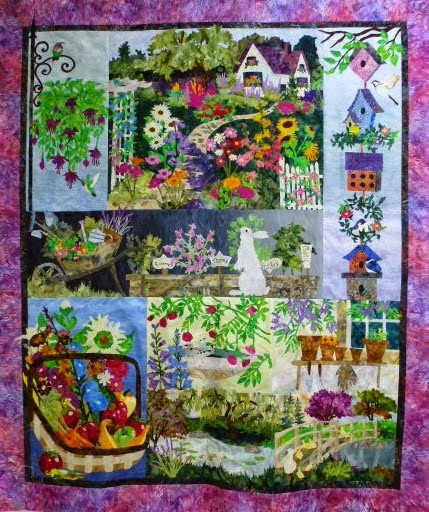 Lyndsey does such wonderful quilts, full of bright saturated colour. This one is fabulous! Look at all the wonderful colour! There are a lot of pieces in this baby, and the quilt was quite large, a wedding gift, I believe she said. It's actually a combination of the Scrappy trips pattern, and a Great Granny Square, where it is built out from the middle, with triangles around the outer edge of each block. It was quilted with an all over pantograph called Trellis Vine. I really like the curves over top of all the small squares, softening all the straight edges, and giving lots of lovely texture as an added dimension to the design. In between working on a customer's quilt today, I started laying out all these squares. A couple of weeks ago, Charlene came over for several hours, and during that time we took out my GO Cutter and tackled some of our scraps. Charlene is also making one of these plus sign quilts, so we decided to do a fabric swap of her fabrics and mine, to increase the variety in our quilts. Charlene is making hers as a charm quilt, with no two plus signs being the same, so she needed lots of variety. I don't think I'll focus too much on using a fabric only once, but instead concentrate on an even distribution of fabrics and colours. I still need some single squares on the outer edge, and then I can start slowly sewing this together. I'm planning on having as one of my goals for next year, to focus on using up scraps. I figure, I may as well get a head start. I'm linking up to The Needle and Thread Network for their work in progress Wednesday. 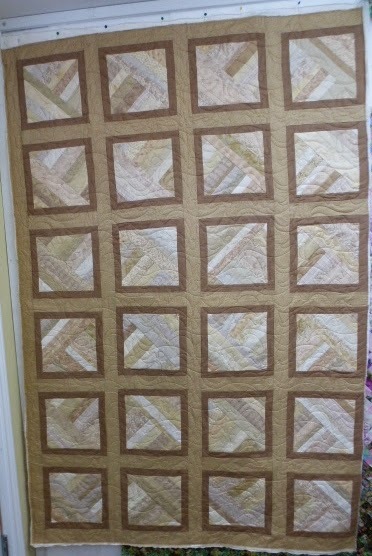 Lorraine says that the stacked coins in this quilt were leftovers from another project. Only in quilting can leftovers turn out looking so good!! There's nothing "leftover" looking about this quilt at all. It looks like it was planned to always be this way. I love the colours in this one. I have a black and red, and a few other colours, quilt that I want to do. Seeing this one makes me want to get started on it. But Christmas is coming, and I must resist the lure of new projects!! This is a close up of the quilting design Lorraine wanted, and a perfect choice for this quilt..... Square Dance pantograph on top of all the squares and rectangles in this fun quilt. After all the sewing during our guild's two day sew-in, I have some stash used. A border for the Triple four patch quilt and 8 blocks for it...... the rest was already counted. I did a backing for the Blooming Nine Patch quilt, and then started using up some four patches in a Sister's Choice variation. I'll count stash used for those blocks as I make them. This is going to be a brief post, as there isn't a whole lot else going on today. I went' out to the yarn store and picked up some stuff to make Avery a sweater for Christmas. And, considering yesterday during our sewing time, someone pointed out to me that tomorrow is the first of December, I'd better get moving on it. I'm not sure what happened or how, but somewhere along the line I've lost a few weeks. What a wonderful couple of days, so much fun, and I got so much done!! My triple four patch that I started last November for the Scrappy Saturday Rainbow Colour Challenge, is a finished top. And I love it!! There's something wrong with the right hand border.... the end units are turned the wrong way, somehow, but I don't care. It's staying in it's imperfection. After I finished the triple four patch quilt, I started on these squares. I have a whole bag full of these little four patches, so I'm going to make them up into these Sister's Choice variation blocks. They'll use up those four patches, and some more yardage and also some 2 1/2 inch scrap strips for the triangles. The plan right now, is to use orange in the same place in all the blocks. I'm not sure if I have enough bright bold oranges, but I'll use up what I have and go from there. I have enough triangles made up to do three more blocks. But I think I'm done sewing for the next day or two.... I've kinda over dosed a bit, but it sure was fun. I'm going to link this up to Soscrappy for the rainbow challenge saturday post. This month's colour was actually light blue, which I didn't get anything done with. But the finish of the quilt from last year is rather exciting. After I post this, I think I'm going to just sit quietly and knit. Just a quick post to show what was accomplished today. All of my triple four patches are sew together into the top. Tomorrow, I will finish off the borders. The Blooming Nine Patch is now a finished top. And it also has a finished backing. There's a close up here, of some of the really cute animal faces poking out behind the balls of yarn, and the blue berry bushes. I'll get better pictures out in the daylight, some other time. It was a fun day, with lots accomplished. And I'm hoping to get lots done tomorrow, too.